In Autumn 2006 an unnerving phenomenon hit the United States: honeybees were mysteriously disappearing from hives across the nation, with beekeepers reporting losses of between 30 and 90 per cent of their entire colonies. The problem soon spread to parts of Europe and even Asia, earning the name Colony Collapse Disorder. To this day nobody is absolutely sure why it is happening and what the exact causes are. However, in 1923 Rudolf Steiner, a scientist, philosopher and social innovator, predicted that bees would die out within 100 years if they were to be reproduced using only artificial methods. Startlingly, and worryingly, his prediction appears to be coming true. Queen of The Sun, What Are the Bees Telling Us? is a companion book to the critically-acclaimed film of the same name. Compiled by the film's director Taggart Siegel, it makes a profound examination of the global bee crisis through the eyes of biodynamic and organic beekeepers, scientists, farmers, philosophers and poets. Revealing the mysterious world of the beehive and the complex social community of bees, the book unveils millennia of beekeeping, highlighting our historic and sacred relationship with bees, and how this is being compromised by highly-mechanized and intensive agro-industrial practices. The bees are messengers and their disappearance is a resounding wake-up call for humanity! With full colour, stunning photography throughout, this engaging, alarming but ultimately uplifting anthology begins with an account of how Siegel's film came to be made. It continues with a wealth of articles, interviews and poems that offer unique philosophical and spiritual insights. Besides investigating many contributory causes of Colony Collapse Disorder, the book offers remedies as well as hope for the future. 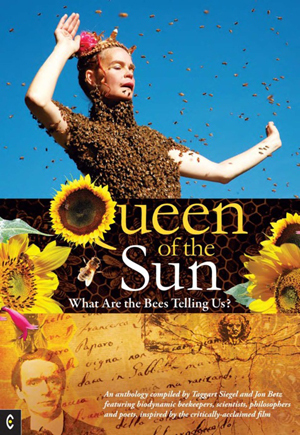 Queen of the Sun features contributions from Taggart Siegel, Jon Betz, David Heath, Gunther Hauk, Horst Kornberger, Jennifer Kornberger, Jacqueline Freeman, Johannas Wirz, Kerry Grefig, Michael Thiele, Raj Patel, Vandana Shiva, Jeffery Smith and Matthew Barton. These compelling voices signal a growing movement striving to found a culture fully in balance with nature.